Bulls starting pitcher new guy Bobby Livingston and Knights starting pitcher Jeff Marquez did fine. Bulls reliever Dale Thayer and Knights reliever Ryan Braun stunk up the yard, but Bulls were ahead by one run when Joe Bateman came on in the 9th. Livingston left the game in the 8th with the Bulls down 1-0, one out, and a man on third. Thayer came in. Single, single, hit by pitch, single and two runs were in and it would have been worse if not for a clever play by Angel Chavez. In the bottom of the 8th Elliot Johnson (who else?) doubled with two out, got to third on a wild pitch, and Justin Ruggiano walked. In came Braun for the Knights. Chris Richard singled, Johnson scored, Ruggiano to second base. Joe Dillon singled, Ruggiano scored, Richard to third base. J. J. Furmaniak came in to run for Joe Dillon. He stole second base. Leslie Anderson singled. Richard scored (game tied). Furmaniak to third base. Angel Chavez doubled. Furmaniak scored the go ahead run. Joe Bateman came in and it was three up-three down for his fourth save. I did make it to the game last night — yahoo. But left at the top of the 7th. Nevertheless, listened on the way home and the 7th and 8th innings went on so long I was able to see the end of the 8th on TV. That means I was able to note the key oddity of the game — Angel Chavez playing first base. That means that Chavez has now played every position in the infield except catcher, but including pitcher and designated hitter. Why was he playing first? Well, J. J. Furmaniak had come in to run for Joe Dillon and he stayed in to play third base and Chavez was moved to first. So, maybe if you see Angel putting on catcher’s gear he’s going for his last unplayed position. Speaking of catchers, you may have seen the name Hollaway on the back of a Bull's jersey last night. He’s a catcher coming up from Single A ball in the Rays system. This appears to be his first year in professional baseball. A bit more info from Adam Sobsey at the Triangle Offense link. Now, just for a moment, let us explain the headline. Joe Bateman made his 52nd appearance last night. That means that in more than a third of the Bulls games this year Mr. Bateman has gone to the mound. How has he done? How about an ERA of 1.71? 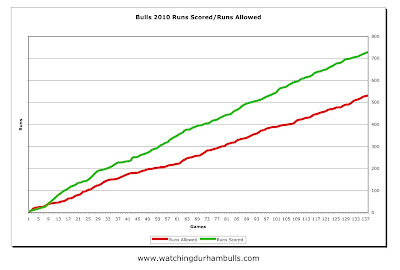 On more innings, 73, than any other Bulls reliever. A FIP of 3.12? Six wins and no losses. Four saves (all in recent weeks when he seems to have gotten more opportunities). The last time he gave up a run was nine appearances ago (August 10th). Plus he’s fun to watch. There’s no doubt that both Joe Bateman and Winston Abreu could help the Rays, but neither has been given a shot this year (so far). Here’s hoping that they do — but wait until after the playoffs, please. Speaking of the Rays: Desmond Jennings started in right field down in St. Pete last night, batting second in the lineup. He was 0 for 3 and got pulled in the 8th for Zobrist who pinch-hit (drew a walk, scored the winning run, and stayed in the game in right). He was interviewed prior to the game by Bulls broadcaster Neal Solondz, who has been in Tampa doing pre and post game stuff for the Rays. Neal due back tonight — another yahoo! 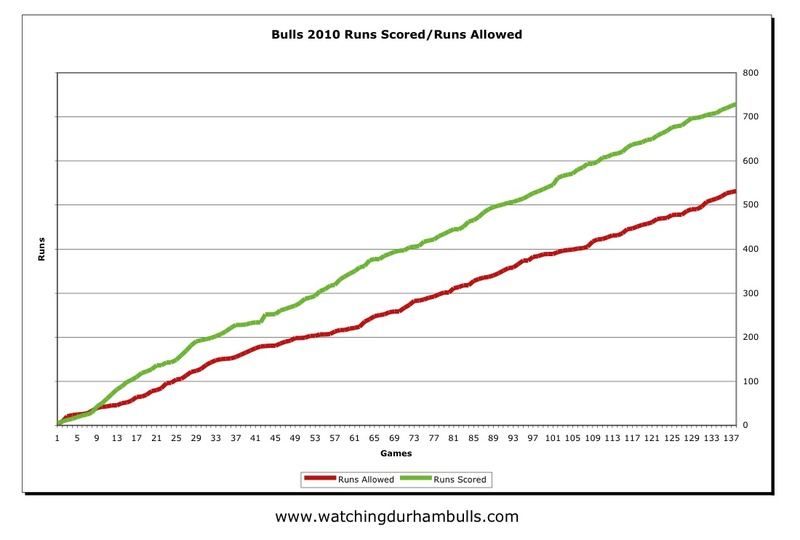 Picture of the day: Just a look at the extraordinary run production of the Durham Bulls this year — 729 runs in 138 games! That is an average of more than five runs per game. And 70 more runs than the Rays have scored, but who's counting? And the season isn't over yet. I'll note an oddity of this game in the form of the Ryaaaaan...Ryaaaaan...chant which seemed to go on for half an hour. So that's what they were saying. I could hear something in the background on the TV. Wonder how that got started? Must have helped. Really cool to come back with two outs. Shows character.